Located at 837 W Apache Trail in Apache Junction. Call Doris 480-671-5600 for complete details. Carfax One Owner Duramax Diesel LTZ in excellent condition. Features leather, premium sound, bedliner,towing package, sliding rear window. This vehicle is loaded with great features, plus it comes with the CARFAX BuyBack Guarantee. Excellence, luxury and stature are just a few of the pillars this car is built upon. Want to brave the road less traveled? You'll have the 4WD capabilities to do it with this vehicle. Added comfort with contemporary style is the leather interior to heighten the quality and craftsmanship for the Chevrolet Silverado 2500HD First Oil Change on us, with every vehicle purchase. Ask if this vehicle qualifies for our Lifetime Engine Warranty! *Diesel and high performance engines are not applicable. Trucks Only has been in business for over 40 years. Our customers have helped us to earn and maintain the A+ rating with the Better Business Bureau and we have been honored to achieve the Customer Satisfaction Award with DealerRater 3 years in a row! Shipping is available across the United States! Please let us know how we can help you find the right solution for your needs! Located at 837 W Apache Trail in Apache Junction. Call Doris 480-671-5600 for complete details. Carfax One Owner Silverado 2500 with towing package, AM/FM/CD/Aux, Cruise control, power windows and locks. Why does this vehicle look so great? The CARFAX report shows it's only been owned by one owner. First Oil Change on us, with every vehicle purchase! Ask if this vehicle qualifies for our Lifetime Engine Warranty! *Diesel and high performance engines are not applicable. Trucks Only has been in business for over 40 years. Our customers have helped us to earn and maintain the A+ rating with the Better Business Bureau and we have been honored to achieve the Customer Satisfaction Award with DealerRater 3 years in a row! Call Doris at 480-671-5600 for complete listing details! Call Trucks Only Internet Department 602-354-7623 for all the specs and to schedule your test drive! Carfax One Owner Chevy Silverado 3500HD with the 6.0L Vortec V8 engine, automatic transmission, towing package, bedliner, power options. First Oil Change on us, with every vehicle purchase. Ask if this vehicle qualifies for our Lifetime Engine Warranty! *Diesel and high performance engines are not applicable. Trucks Only has been in business for over 40 years. Our customers have helped us to earn and maintain the A+ rating with the Better Business Bureau and we have been honored to achieve the Customer Satisfaction Award with DealerRater 3 years in a row! Call Trucks Only Internet Department 602-354-7623 for all the specs and to schedule your test drive! Shipping is available across the United States! Please let us know how we can help you find the right solution for your needs! Located at 837 W Apache Trail in Apache Junction. Call Doris 480-671-5600 for complete details. Are you looking for an all-around 4x4 for day to day use, weekend warrior getaways, and to get out and go fishing? This 2017 Chevy Silverado 1500 with matching shell, towing package, AM/FM/CD/Aux, OnStar, and Z71 off-road package will do nicely. Where do you want to go today? With 4WD, you can choose to drive virtually anywhere and on terrain 2WD vehicles can't handle. First Oil Change on us, with every vehicle purchase. Ask if this vehicle qualifies for our Lifetime Engine Warranty! *Diesel and high performance engines are not applicable. Trucks Only has been in business for over 40 years. Our customers have helped us to earn and maintain the A+ rating with the Better Business Bureau and we have been honored to achieve the Customer Satisfaction Award with DealerRater 3 years in a row! Shipping is available across the United States! Please let us know how we can help you find the right solution for your needs! Located at 837 W Apache Trail in Apache Junction. Call Doris 480-671-5600 for complete details. Drive home in your new pre-owned vehicle with the knowledge you're fully backed by the CARFAX Buyback Guarantee. 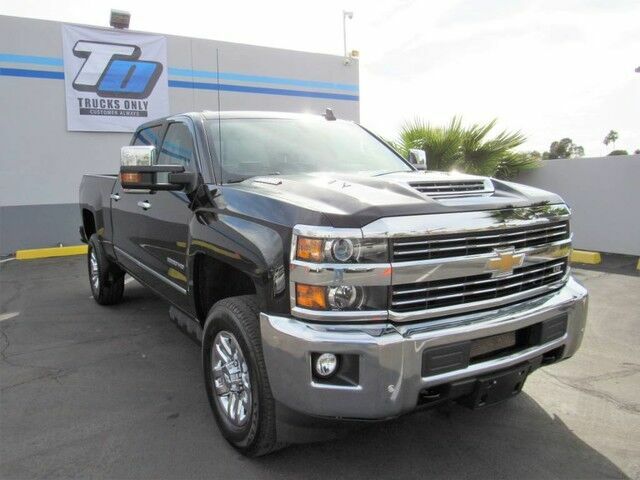 Quality and prestige abound with this Chevrolet Silverado 2500HD. It's not often you find just the vehicle you are looking for AND with low mileage. This is your chance to take home a gently used and barely driven Chevrolet Silverado 2500HD. Added comfort with contemporary style is the leather interior to heighten the quality and craftsmanship for the Chevrolet Silverado 2500HD The Silverado range is always one of GM's biggest sellers. This means GM is always endeavoring to innovate and continue to improve the truck's design. As a result, the consumer wins--whether hauling equipment to a job site, working a farm or towing a boat, the Silverado 2500 and 3500 are built for tough work, and are some of the best-designed trucks available from any manufacturer. Made in either short- or long-bed form, with 2- or 4-wheel drive, optional dual rear wheels and with a choice of several impressively powerful engines, the Silverado can be set up do just about anything asked of it. The 2500, even simply configured, is capable of towing over 10,000 pounds and base prices start around $25,000. This model sets itself apart with powerful engine lineup, available 4-wheel drive, Superior heavy-duty towing and hauling capability, wide variety of configurations, and class-leading design. First Oil Change on us, with every vehicle purchase! Ask if this vehicle qualifies for our Lifetime Engine Warranty! *Diesel and high performance engines are not applicable. Trucks Only has been in business for over 40 years. Our customers have helped us to earn and maintain the A+ rating with the Better Business Bureau and we have been honored to achieve the Customer Satisfaction Award with DealerRater 3 years in a row! Call Doris at 480-671-5600 for complete listing details! Call Trucks Only Internet Department 602-354-7623 for all the specs and to schedule your test drive! 2016 Suburban LT 2WD with leather, 3rd row seating. First Oil Change on us, with every vehicle purchase. Ask if this vehicle qualifies for our Lifetime Engine Warranty! *Diesel and high performance engines are not applicable. Trucks Only has been in business for over 40 years. Our customers have helped us to earn and maintain the A+ rating with the Better Business Bureau and we have been honored to achieve the Customer Satisfaction Award with DealerRater 3 years in a row! Call Trucks Only Internet Department 602-354-7623 for all the specs and to schedule your test drive! Shipping is available across the United States! Please let us know how we can help you find the right solution for your needs! Call Trucks Only Internet Department 602-354-7623 for all the specs and to schedule your test drive! You deserve a vehicle designed for higher expectations. This Chevrolet Silverado 2500HD delivers with a luxurious, well-appointed interior and world-class engineering. Equipped with 4WD, this Chevrolet Silverado 2500HD gives you added confidence to tackle the surface of any path you take. First Oil Change on us, with every vehicle purchase. Ask if this vehicle qualifies for our Lifetime Engine Warranty! *Diesel and high performance engines are not applicable. Trucks Only has been in business for over 40 years. Our customers have helped us to earn and maintain the A+ rating with the Better Business Bureau and we have been honored to achieve the Customer Satisfaction Award with DealerRater 3 years in a row! Call Trucks Only Internet Department 602-354-7623 for all the specs and to schedule your test drive! Shipping is available across the United States! Please let us know how we can help you find the right solution for your needs! Located at 837 W Apache Trail in Apache Junction. Call Doris 480-671-5600 for complete details. First Oil Change on us, with every vehicle purchase! Ask if this vehicle qualifies for our Lifetime Engine Warranty! *Diesel and high performance engines are not applicable. Trucks Only has been in business for over 40 years. Our customers have helped us to earn and maintain the A+ rating with the Better Business Bureau and we have been honored to achieve the Customer Satisfaction Award with DealerRater 3 years in a row! Call Doris at 480-671-5600 for complete listing details! Located at 837 W Apache Trail in Apache Junction. Call Doris 480-671-5600 for complete details. This 2017 Chevrolet Silverado 1500 comes with a CARFAX Buyback Guarantee, which means you can buy with certainty. A Chevrolet with as few miles as this one is a rare find. This Silverado 1500 Custom was gently driven and it shows. Carfax One Owner Silverado 1500 with low miles! Fuel efficient 4.3L Flex Fuel V6 engine, automatic transmission. First Oil Change on us, with every vehicle purchase. Ask if this vehicle qualifies for our Lifetime Engine Warranty! *Diesel and high performance engines are not applicable. Trucks Only has been in business for over 40 years. Our customers have helped us to earn and maintain the A+ rating with the Better Business Bureau and we have been honored to achieve the Customer Satisfaction Award with DealerRater 3 years in a row! Shipping is available across the United States! Please let us know how we can help you find the right solution for your needs! Located at 837 W Apache Trail in Apache Junction. Call Doris 480-671-5600 for complete details. This well-maintained Chevrolet Silverado 1500 LT comes complete with a CARFAX one-owner history report. You can tell this 2016 Chevrolet Silverado 1500 has been pampered by the fact that it has less than 25,591mi and appears with a showroom shine. First Oil Change on us, with every vehicle purchase. Ask if this vehicle qualifies for our Lifetime Engine Warranty! *Diesel and high performance engines are not applicable. Trucks Only has been in business for over 40 years. Our customers have helped us to earn and maintain the A+ rating with the Better Business Bureau and we have been honored to achieve the Customer Satisfaction Award with DealerRater 3 years in a row! Shipping is available across the United States! Please let us know how we can help you find the right solution for your needs! Located at 837 W Apache Trail in Apache Junction. Call Doris 480-671-5600 for complete details. Silverado 1500 4x4 with LT trim package, power options, bedliner, towing package. First Oil Change on us, with every vehicle purchase. Ask if this vehicle qualifies for our Lifetime Engine Warranty! *Diesel and high performance engines are not applicable. Trucks Only has been in business for over 40 years. Our customers have helped us to earn and maintain the A+ rating with the Better Business Bureau and we have been honored to achieve the Customer Satisfaction Award with DealerRater 3 years in a row! Shipping is available across the United States! Please let us know how we can help you find the right solution for your needs! Located at 837 W Apache Trail in Apache Junction. Call Doris 480-671-5600 for complete details. The best part about this well-maintained vehicle is that it is a CARFAX one-owner vehicle. Beautiful color combination with Summit White exterior over Dark Ash with Jet Black Interior Accents interior making this the one to own! Just what you've been looking for. With quality in mind, this vehicle is the perfect addition to take home. The quintessential Chevrolet -- This Chevrolet Silverado 1500 LS speaks volumes about its owner, about uncompromising individuality, a passion for driving and standards far above the ordinary. First Oil Change on us, with every vehicle purchase. Ask if this vehicle qualifies for our Lifetime Engine Warranty! *Diesel and high performance engines are not applicable. Trucks Only has been in business for over 40 years. Our customers have helped us to earn and maintain the A+ rating with the Better Business Bureau and we have been honored to achieve the Customer Satisfaction Award with DealerRater 3 years in a row! Shipping is available across the United States! Please let us know how we can help you find the right solution for your needs! Located at 837 W Apache Trail in Apache Junction. Call Doris 480-671-5600 for complete details. Carfax One Owner Chevy Silverado with low miles, premium wheels. First Oil Change on us, with every vehicle purchase. Ask if this vehicle qualifies for our Lifetime Engine Warranty! *Diesel and high performance engines are not applicable. Trucks Only has been in business for over 40 years. Our customers have helped us to earn and maintain the A+ rating with the Better Business Bureau and we have been honored to achieve the Customer Satisfaction Award with DealerRater 3 years in a row! Shipping is available across the United States! Please let us know how we can help you find the right solution for your needs! Located at 837 W Apache Trail in Apache Junction. Call Doris 480-671-5600 for complete details. Carfax One Owner Chevy Silverado 2WD LS with AM/FM/CD/Aux, cruise control, bed liner, towing package, and new tires. First Oil Change on us, with every vehicle purchase. Ask if this vehicle qualifies for our Lifetime Engine Warranty! *Diesel and high performance engines are not applicable. Trucks Only has been in business for over 40 years. Our customers have helped us to earn and maintain the A+ rating with the Better Business Bureau and we have been honored to achieve the Customer Satisfaction Award with DealerRater 3 years in a row! Shipping is available across the United States! Please let us know how we can help you find the right solution for your needs! Located at 837 W Apache Trail in Apache Junction. Call Doris 480-671-5600 for complete details. LTZ package Chevy Avalanche 4x4 with leather, heated seats, premium sound, bedliner, and towing package. Dealer maintained with many records. First Oil Change on us, with every vehicle purchase. Ask if this vehicle qualifies for our Lifetime Engine Warranty! *Diesel and high performance engines are not applicable. Trucks Only has been in business for over 40 years. Our customers have helped us to earn and maintain the A+ rating with the Better Business Bureau and we have been honored to achieve the Customer Satisfaction Award with DealerRater 3 years in a row! Shipping is available across the United States! Please let us know how we can help you find the right solution for your needs!